Few injuries are as devastating as losing an appendage. A lost limb can diminish your employment possibilities and make everyday activities virtually impossible without some level of assistance. These physical disabilities serve as constant reminders of your loss. Whether it occurs during the accident or out of medical necessity following an accident, any amputation is a traumatic event that affects you socially and psychologically. Amputation refers to the loss of any body part as a result of an accident. This includes the loss of an arm, leg, finger, foot, toe or combination of parts. Our experienced trial lawyers have handled amputation cases resulting from numerous types of accidents, including motor vehicle crashes, industrial accidents, defective products, and other injury-causing incidents. We have the knowledge and resources to conduct an extensive investigation into the accident so that the culpable party is held responsible and future similar accidents can be prevented. With skilled negotiators and litigators on your side, you can take on the task of healing with confidence that your right to compensation will be aggressively pursued. Our firm has successfully handled a wide range of loss-of-limb cases, as well as loss-of-use injuries (paralysis). We have also represented victims whose limbs had to be surgically amputated as a result of another’s negligence. Prosthetic limbs and future replacements. According to the Hospital for Special Surgery, the cost of a prosthetic can range from $5,000 to $50,000, depending on the affected body part. However, the average prosthetic only lasts three to five years. 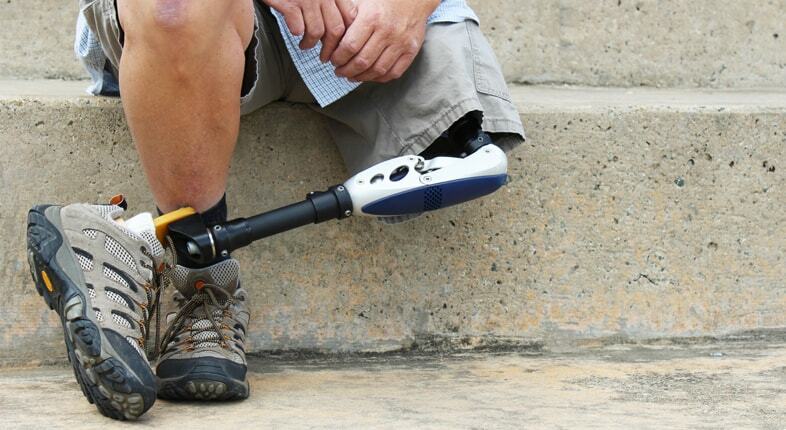 Each new prosthetic limb represents an additional cost for the victim. Home or vehicle modifications. In order to handle daily activities and self-care, some amputation patients require structural modifications to their homes and vehicles. These necessities can be extremely expensive for the victim and the victim’s family. Permanent disability. As an amputation victim, you must live with a permanent disability that will last for the remainder of your lives. This impairment may keep you from reaching life-long goals or continuing with activities that you always enjoyed. Our skilled Los Angeles amputation accident lawyers believe that a diminished quality of life deserves substantial compensation from all responsible parties. Loss of earning capacity. Our professionals examine your earning capacity before and after your amputation to quantify the amount of income you will lose due to your injury. This cost can be significant, especially for individuals like athletes or musicians whose amputation cost them their talents. Physical and vocational rehabilitation. In an effort to promote a high quality of life, amputation patients undergo months, and sometimes years, of rehabilitation. Physical rehabilitation assists with the recovery of everyday actions and abilities. Vocational rehabilitation assists with preparing to find and maintain employment. Psychological counseling for emotional trauma. The psychological trauma of an amputation is devastating. It is common for victims to grieve the loss of a limb, which can manifest as depression, stress and loss of self-esteem. Professional counseling is often necessary to deal with these mental and emotional challenges. People who have lost limbs can go on to lead happy and productive lives. However, recovery requires many expenses and financial challenges for you and your family. Our firm commits the energy and resources necessary to establish liability and maximize compensation so our clients can experience their best quality of life. Taylor & Ring has obtained justice in the most complex personal injury cases, including amputation injuries. Along the way, we provide legal support and connect clients to top medical specialists to aid in their recovery. For a free consultation with our Manhattan Beach amputation attorneys, call 310-776-6390 or complete our contact form today.